As if candy wasnâ€™t enough to jolt you back into the moment, we have plenty of super-charged, hulked-up versions of candy these days. 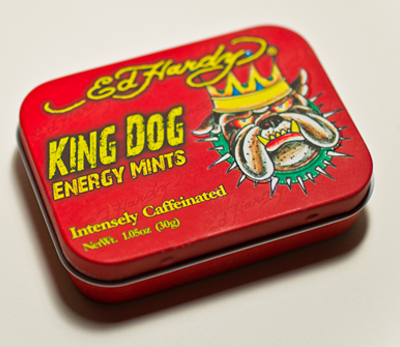 One of these candy-on-steroids is Ed Hardy King Dog Energy Mints. They are â€œintensely caffeinatedâ€ mints and are sure to clear away the fog that rolls in post-lunch. Five of these bad boys have 100mg of caffeine and are equivalent to a cup of coffee. Grab a tin of these super-minty mints and youâ€™ll be jacked up in no time – and as an added bonus youâ€™ll have squeaky-clean breath. Youâ€™ll have to get past their not so awesome taste, though, as they taste like minty cough syrup. Iâ€™m definitely not a huge fan of the weird aftertaste that is pretty common in hyper-caffeinated products and quite noticeable in these mints. 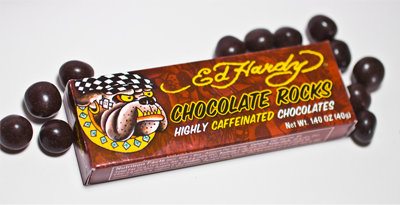 I prefer the Ed Hardy Chocolate Rocks to the mints. They donâ€™t taste half bad (but not exactly half good, either) and a whole box is about 6 cups of coffee! Iâ€™d take the Chocolate Rocks over the Energy Mints any day as I usually prefer chocolate to a mint. They remind me of a chocolate covered coffee bean without the bean, but, with all the caffeine. They still have that chemical/caffeine taste, but itâ€™s less bothersome in the Chocolate Rocks. 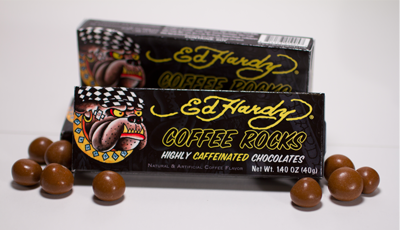 Now, the Ed Hardy Coffee Rocksâ€¦ thatâ€™s where itâ€™s at! They have a believable coffee taste and I totally plan on downing a box in the morning in anticipation of a super hectic day. I think Iâ€™ll sleep a little better knowing they will be waiting for me in the morning! All in all, I think the Ed Hardy brand of candy is still pretty neat. Awesome packaging, and caffeine in a pocket is much easier than caffeine in a cup. Sure, theyâ€™ve got a bit of a chemical taste that I find off-putting, but hey, Iâ€™m not eating them for their taste. Iâ€™ve got things to do! Because function rules over form in my book, they get 3 Bonbons! Ed Hardy Energy Mints are wonderful. Where else can you get 8 cup’s worth of coffee for $2.99? I love the Energy Mints. What a wallop and fresh breath too!